A community fears split and segregation after the murder of a young boy in a small coastal town called Broadchurch, attracts huge media attention. Where can you stream Broadchurch? On 2013-03-04 Crime/Drama TV Series Broadchurch first aired on ITV. 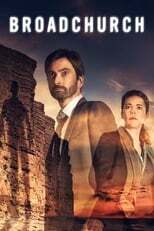 Written and created by Chris Chibnall, and produced by Imaginary Friends & Kudos, Broadchurch has ended and last broadcasted on 2017-04-17.